This website serves as a resource for news reports and upcoming events related to transnational land and water acquisitions, more commonly referred to as "land grabbing" and "water grabbing." GRAIN, a small international non-profit focused on supporting small farmers in their struggle for food sovereignty, has maintained the site as a continuation of the 2008 report by the same organization. The website is an open project so users are able to upload contributions. The website is updated daily, but you may also choose to track updates in real time through the RSS feed or to subscribe to the e-mail service. An August 2012 statement from Grain leads with the following assessment of recent World Bank led voluntary guidelines for global farmland investing in lesser developed countries : "Responsible farmland investing? Current efforts to regulate land grabs will make things worse." This video, uploaded by the Food and Agriculture Organization of the United Nations (FAO), features David Hallam of the organization’s Trade and Markets Division answering many of the most frequently asked questions about present-day international land grabbing. Some of the more prominent issues covered include the negative influences of the international media, the causes for the recent increase in transactions, and what factors tend to motivate the key players. This list of literature on land grabbing – produced by the Kiel Institute for the World Economy, the University of Greifswald, and the GIGA German Institute of Global and Area Studies, Hamburg – is an excellent resource for anyone looking to learn more about the history and emerging trends of this international phenomenon. This webpage provides an overview of the incentives and processes required to create the Voluntary Guidelines on the Responsible Governance of Tenure of Land, Fisheries and Forests in the Context of National Food Security (VG). The FAO launched the initiative in 2009 as a means to establish internationally accepted principles and standards that would help facilitate environmental stewardship, socio-political development, and economic growth. The webpage was produced by the International Planning Committee for Food Sovereignty, an international network of food producers, indigenous groups, and other active parties. The final form of the VG – as endorsed by the Committee on World Food Security (CFS) earlier this year – can be found on the FAO website, along with additional information and resources. Click here for an article by Reuters on the initial FAO announcement following international consensus to produce the UN-backed guidelines. This press release details the extremely positive reaction of the United States Agency for International Development (USAID) to the passage of the Voluntary Guidelines on the Responsible Governance of Tenure of Land, Fisheries and Forests (VG) by the FAO. USAID is the U.S. Government (USG) agency whose work has been most directly affected by this shift in international policy, and it is worthwhile to explore how the agency contextualizes the VG within its own body of work. This webpage provides further insight in the form of an overview of land tenure issues along with a corresponding issue brief, fact sheet, and related documents. The Annual World Bank Conference on Land and Poverty brings together an array of global leaders in the land sector - ranging from representatives of government and civil society to innovators in the private sector and the development community - to share success stories from the field and to promote dialogue on how to work towards a more sustainable future. In many ways, the conference is a direct reflection of the Responsible Agricultural Investment (RAI) Principles, a discussion note jointly prepared by the World Bank, the UN Food and Agriculture Organization (FAO), the International Fund for Agricultural Development (IFAD), and the UN Conference on Trade and Development (UNCTAD). Simply put, the RAI Principles respond to the "land grabbing" phenomenon by encouraging investment in underdeveloped rural regions to help close the gap between lower income developing states and their wealthier counterparts. In a global context, this roughly equates to encouraging land grabs in Sub-Saharan Africa while being more mindful of such activities in Latin America and South and Southeast Asia. Although the RAI Principles claim economic growth and poverty alleviation as their primary targets, there is also limited emphasis on human rights and environmental justice issues. As such, it is particularly important to consider the influence of RAI's primary stakeholders on the creation of this "comprehensive" analysis of emerging trends and best practices. This comparative chart produced by the FoodFirst Information and Action Network (FIAN) highlights the primary differences between two of the most important sets of international guidelines for best practices related to land, agriculture, and/or natural resources - the VG produced by the FAO and the RAI produced by the World Bank, the FAO, the IFAD, and the UNCTAD. The chart provides an overview of each document with respect to its historical background, instrumental nature, core content and scope, institutional context and modality of adoption, status of preparation, and corresponding role of civil society. Notes and comparisons of both documents with respect to each of these categories are also included. This webpage provides a basic overview of the global land grabbing phenomenon, as well as links to key resources such as FIAN’s campaign to ban land grabbing and its corresponding report on “Why We Oppose the Principles for Responsible Agricultural Investment (RAI).” FIAN is an international, membership-based organization whose national and regional sections are independent legal entities. Its members utilize diverse tactics ranging from political advocacy to public education in order to help realize the universal right to adequate food. Land Portal is a public platform originated by the International Land Coalition (ILC) and Landtenure.info as a means for sharing information and monitoring trends related to land rights and governance. With the primary goal of identifying and rectifying information gaps, Land Portal operates forums for a variety of topics that include the environment, food security, commercial pressures, gender issues, and indigenous peoples. Perhaps most importantly, Land Portal is an excellent resource for news and events along with links for partner websites and for pertinent international policies and guidelines. This 2011 short paper by the International Fund for Agricultural Development (IFAD), a specialized agency of the United Nations, seeks to provide an overview of the "land grabbing" phenomenon along with a corresponding set of guidelines for good land governance and responsible investment in agriculture. Above all else, the analysis stresses the need for additional research to determine how these actions impact both the environment and the local stakeholders, most notably smallholder farmers, pastoralists, and indigenous communities. With respect to the best course of action, the IFAD notes that cooperation government, private sector, civil society, and local community representatives will be required in order to realize truly sustainable solutions on the ground. Inter Press Service (IPS) provides a more in-depth analysis of many environmental and social justice issues than comparable news agencies, especially regarding developments in the Global South. With respect to the land grabbing phenomenon, IPS addresses a variety of critical issues ranging from the role of the World Bank and other multilateral institutions to the effects of the biofuel industry. Perhaps most importantly, IPS also provides a series of regional and country-specific analyses for Latin America (e.g. Brazil, Argentina, and others), South Asia (e.g. India), and particularly for Africa (e.g. Kenya). Although each piece has something powerful to add to the running dialogue on land grabbing, the diversity of content and corresponding perspectives should encourage critical readers to maintain a distinction between articles that seek to provide an overview of recent developments and those with a more explicit agenda. IPS also covers a host of other developments related to land, agriculture, and water issues including: climate change, desertification, loss of biodiversity, and water scarcity and sanitation. This video, uploaded by the transnational ethnic interest organization International Relations and Tamil’s Affairs Group (IRTAG), utilizes an array of short news clips from Bloomberg TV to outline evolving issues in land grabbing in early 2008. The montage focuses primarily on (1) increasing food riots in the developing world due to global declines in food production and (2) the subsequent economic downturn, with a particular emphasis on specific agricultural price predictions. Among the more notable talking heads are UN Secretary-General Ban Ki-Moon, former World Bank President Robert Zoellick, former International Monetary Fund (IMF) Managing Director Dominique Strauss-Kahn, and Senior FAO Grains Economist Abdolreza Abbassian. This short video from The Global Report, a nonprofit news provider that seeks to “cover news underreported by mainstream media,” takes a critical stance against land grabbing, which it blatantly refers to as an act of neo-colonialism. 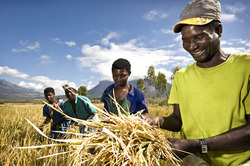 The Alliance for a Green Revolution in Africa (AGRA) is an initiative to promote public and private partnerships that concentrate investment in the breadbasket regions of four main countries - Ghana, Mali, Mozambique, and Tanzania - in order to improve individual farmer productivity and increase regional food security. The organization focuses on smallholder farmers since these actors produce the bulk of Africa's foodstuffs despite often being marginalized in international political and economic spheres. Some of the major issues AGRA seeks to combat are soil degradation, water scarcity and contamination, limited access to equitable markets, limited access to credit, and lack of physical and government infrastructure. Currently, AGRA also works in South Africa, Malawi, Zambia, Uganda, Kenya, Ethiopia, Rwanda, Nigeria, Niger and Burkina Faso. For specific information on AGRA projects and their effects, see the official site's page on results overview and annual reports. The AGRA News & Events page is an excellent resource for information on emerging trends, stories, and events in the region. Additionally, Food Security Ghana hosts a variety of recent news reports on AGRA and the issues it seeks to address. The self-proclaimed purpose of this report is to discuss “key trends and drivers in land acquisitions, the contractual arrangements underpinning them and the way these are negotiated, as well as the early impacts on land access for rural people in recipient countries” in sub-Saharan Africa. Among the most important regional developments are (1) sizeable increases in the average number and size of land grabs across the continent, as well as (2) the growing dominance of the private sector, particularly through foreign investment. The report is the result of a collaborative effort between the FAO, the International Fund for Agricultural Development (IFAD), and the International Institute for Environment and Development (IIED). This report on land grabbing in Africa was produced by the Global Land Project, a joint research initiative for land systems produced by the International Geosphere-Biosphere Programme (IGBP) and the International Human Dimensions Programme on Global Environmental Change (IHDP). At its heart, the report emphasizes the role of human land use decisions - particularly with respect to agriculture, urbanization, deforestation, and pollution - as a link between the most important social, economic, and environmental catalysts for land grabbing. In this context, the report draws a direct connection between the recent increases in land investment in the "Global South" (and in Africa, in particular) and the increasing global demand for food crops, biofuels, mineral deposits, and other alternatives energies. Perhaps most importantly, it provides a critical analysis of the media as the largest source of information on land grabbing in Africa and around the world. This article treats the steady increase in the quantity and scale land grabbing that has been sweeping the African continent since the turn of the century. The authors make the information accessible for readers who are less familiar with the issues by analyzing the situation (including the actors, their incentives, and the corresponding process) within both its regional and international context (including consequences for African states and options for the future). This article by African Renewal, which is produced by the Africa Section of the United Nations Department of Public Information, seeks to address both the potential benefits and the emerging problems associated with the recent surge of land grabs in Africa. 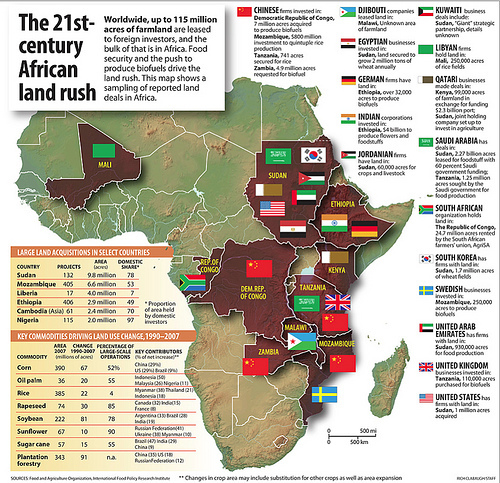 Some of the key issues touched upon include the massive scale of recent land grabs, the effects of increasing demands for food and biofuels, the role of land distribution and legal titles, and the various environmental, economic, and socio-political conditions that make Africa exceptional in this context. This news article by GRAIN, a small international non-profit focused on supporting small farmers in their struggle for food sovereignty, seeks to support a wide array of Latin American and Caribbean social movements and organizations in their struggle to end land grabbing. 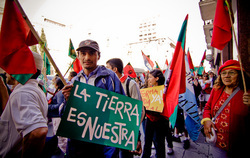 These groups drafted and signed the “Declaration of Buenos Aires” at the third special Conference on Food Sovereignty, purposefully held just prior to the FAO’s Regional Conference for Latin America and the Caribbean, in order to oppose the FAO’s downplaying of land grabbing as a regional issue outside of Argentina and Brazil. This paper by Logan Cochrane treats the philosophical and pragmatic differences between the complementary concepts of food security and food sovereignty within the context of the "land grabbing" phenomenon. In Cochrane's own words, "food security means the availability and access to sufficient safe food, whereas food sovereignty involves both ownership and the rights of local people to define local food systems, without first being subject to international market concerns." Following this simple introduction to the subject matter, however, Cochrane explores the nuances of each concept and why it is crucial for policymakers, stakeholders, and concerned citizens to understand them as such. The remainder of the paper focuses on land grabbing (including a detailed case study of Ethiopia) and concludes with a list of subsequent recommendations. On its official website, La Via Campesina describes itself as an "international movement ... of peasants, small and medium-size farmers, landless people, women farmers, migrants and agricultural workers" whose goal is to "defend small-scale sustainable agriculture as a way to promote social justice and dignity." Just three years after its creation, La Via Campesina coined the term "food sovereignty" at the 1996 World Food Summit. Since then, it has remained a key player in the global politics and economics of food and agriculture, particularly regarding issues of environmental and economic sustainability, social justice, land ownership, gender equity, and rural development. Its website also serves as an excellent resource for present-day issues and regional news stories. Oakland Institute is an independent policy think tank that focuses on a range of socio-economic and environmental issues, including but not limited to agricultural sustainability, rising food prices, climate change, and land rights. While it produces publications that treat a variety of more specific topics, much of Oakland Institute’s recent work has focused on the land grabbing phenomenon (e.g. this impressive country-specific series on Understanding Land Investment Deals in Africa). By seeking to address each subject in its given geographical, political, economic, and cultural context, Oakland Institute can be an invaluable source of information for anyone seeking to go beyond the coverage of mainstream media. Transnational Institute (TNI) is an international think tank that works with social movements, policymakers, and practitioners from around the world to respond to global threats to environmental and economic justice, as well as to cover related issues such as armed conflicts and resistance struggles. More specifically, TNI has covered land rights from a variety of critical angles, including: a preliminary analysis of the land grabbing phenomenon; a rights-based approach to viable land investment alternatives; several regional analyses of land investment trends (e.g. Latin America and the Caribbean, Africa, and the European Union); and an event at the 2010 FAO Food Security World Committee session. Not surprisingly, the organization addresses water rights in a comparable manner that ranges from introductory overviews to regional spotlights. Please examine TNI’s list of work areas for more information on these and other issues. One of the contributing factors to the global land grab is the role of international economic institutions such as the World Bank and International Monetary Fund in encouraging - or more accurately, prescribing - a shift from subsistence agricultural to export-driven agriculture. While few doubt that subsistence agriculture alone is a viable path to economic prosperity, or even a robustly secure bulwark against all causes of food scarcity, there many critics who argue that export-driven agricultural policies, coupled with existing agriculture subsidies in the US and EU, have accelerated domestic poverty and entrenched the role of foreign extractive industries as a major element of developing economies. The International Food Policy and Research Institute has published a 2012 report, Strategies and Priorities for African Agriculture: Economywide Perspectives from Country Studies, that addresses this common complaint. Its authors "argue that, although the diversity of the region makes generalization difficult, increasing staple-crop production is more likely to reduce poverty than increasing export-crop production. This conclusion is based on case studies of ten low-income African countries that reflect varying levels of resource endowments and development stages. The authors also recommend increased, more efficient public investment in agriculture and agricultural markets and propose new directions for future research." The problems of export-driven agriculture are magnified when coupled with other economic liberalization policies that open the doors to more foreign investment in extractive industries, including large agricultural facilities that are supported by host-state concessions designed to attract investment, while leaving behind considerable environmental damage but little economic prosperity. Lack of stable land ownership arrangements and secure legal mechanisms for titling of land make the worst of abuses easier. Indigenous communities often lack formal legal title to their ancestral lands. Land that is in theory held in common by the citizens of a county is easily expropriated by the state and then made available either for the use of local elites or foreign business interests who pay the state for mining rights or for establishing large agricultural enterprises. While grossly unfair systems of property ownership are problematic for obvious reasons, lack of any publicly known, regularly enforced, and transferable system of property rights can limit access to credit, undermine opportunities for economic improvement, and leave the poorest segment of society at the absolute mercy of ruling elites and foreign business who cater to them. One international organization devoted to legal empowerment is Namati.org. You can download the executive summary of their report on success in the protection of community land and resources through legal title arrangements, or the whole report, Protecting Community Lands and Resources from their website.